Lush Wine Blog: Read it. Drink it. | Wine is fun. Put some in your glass and keep reading. Holla. Shout from the rooftops and tell all your friends; Lush in University Village has a rocking patio that is just itching to be used every single day of sunshine and warm(er) temps. 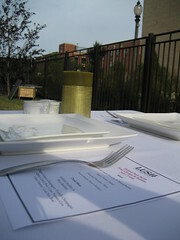 And, what better way to utilize the short Chicago summer than to sip away the evening and EAT outside! The Lushies have been whipping up a full schedule of food and wine events, so please join us for a lovely evening, or jump in on them all! RSVP required and all reservations are NON-REFUNDABLE. Serious. Each event is open to 25 people. Groups are welcome and encouraged. We expect to serve 4 courses, family style, and pour you the approximation of 4 glasses of wine. Yes, that translates to MORE than you could feasibly eat or drink. Please consider arranging transportation. The cost will fluctuate depending upon the event. More details to come. Call 312.738.1900 to reserve a seat. You may also email erin@lushwineandspirits.com. EAT, DRINK, and be MERRY with us! Saturday, June 4th, 6-8:30pm: PATIO SERIES – PAELLA. Saturday, June 25th, 6-8:30pm: RIBS and Rose and Zinfandel. Smoked. Grilled. Rubbed with love. And delicious spices. The wines are pairing perfection. Taxes & tip included. RSVP required and the seat is non-refundable, period. $65. Fried Chicken and bubbles. One of the finer pairings in life. Finger lickin’ good. The bestest picnic around. Taxes & tip included. RSVP required and the seat is non-refundable, period. $65. Running of the crabs! This is the season of fresh crab. Boys only will be boiled. Tiny hammers and little forks. A napkin bib. And crispy wines. Taxes & tip included. RSVP required and the seat is non-refundable, period. $65. A lovely little brunch of fresh oysters. East coast, West coast, and bi-coastal. Ranging from salty to creamy, fruity and funky. Taste the delicious morsels in a rocky little package. We tasted American. English. And Belgian style brewing. Beautiful (and creepy) labels catch the eye. The rest happens in the bottle, in the glass, and with friends. It is all about collaboration. So, join LUSH and Mister Strumke for an epic evening of beer…swing by to check it out. More special, rare, and delicious gypsy ales jumping onto the shelves soon. You HAVE to make this tasting. The most epic of all! Set to task, dedicated to choosing our very most favoritest wines, we set a very strict set of criteria…we want outrageous quality for the cash, of course, but we also require craft winemaking, juice that speaks of where it comes from and that inexplicable, intangible, expression of something extraordinary.Our staff picks of the year are titillating, intellectual stimulating, and definitely remarkable…unforgettable, even. So, we are memorializing our favorites of the year in this year end rewind.STAFF PICKS! Vol. 2 : Veterans!